As of June 11, 2010, The Marine Mammal Center has admitted just over 800 marine mammals which is more than its yearly average of 600. Volunteers and staff are working around-the-clock to provide medical care so that these and so many other seals and sea lions may have a second chance at life back in the ocean! The Marine Mammal Center releases nine marine mammals (four sea lions, five elephant seals) back to the ocean on World Oceans Day, June 8, 2010. On June 8, 2010, in a fitting tribute to the spirit of World Oceans Day, nine animals (four California sea lions, and five northern elephant seals) were released at Chimney Rock, Point Reyes National Seashore. Many of these now former patients were rescued during the months of April and May for a variety of reasons including malnutrition, or, in the case of a sea lion named Pinto Bean, trauma as a result of an entanglement in netting. Volunteers and staff nursed these animals back to health by providing the proper nourishment each patient needed to put on weight and build up muscles. Read more about their stories here. On June 7, veterinarians re-examined all nine candidates for release and were happy to report that the pinnipeds were ready for life back in the wild! The following morning, all nine were loaded into travel carriers and on to trucks readied for the journey up north to Point Reyes National Seashore where they were released. In December 2008, the United Nations General Assembly passed a resolution declaring June 8 as World Oceans Day. The concept was first proposed in 1992 at the UN Conference on Environment and Development in Rio de Janeiro. The official designation of World Oceans Day is an opportunity to raise global awareness of the current challenges faced by the international community in connection with the oceans. Will 2010 be another record year of rescues? The Center's work highlights the vital link between our oceans, marine mammals, and humans. As of June 8, the Center's pens and pools were brimming with just over 150 patients. This year is turning out to be another busy year for staff and volunteers who, as of July 11, have admitted 803 seals, sea lions and other marine mammals. In comparison, by June 8, 2009 (a record year in and of itself) 547 animals were admitted and by the end of the year, that number had ballooned to 1,706. While the pace seems to have slowed a little bit in 2010, this year has been a challenging one for marine mammals as more and more become ill from eating fish that have ingested toxic algal blooms along the California coast or have suffered from leptospirosis, malnourishment, and human-caused problems such as entanglements in marine debris. Additionally, an unusual number of sea lion pups have been born in non-traditional rookery areas such as Pier 39 in San Francisco. To date, the Center has rescued 15 of these pups. Read more here. Visit our Sausalito headquaters and learn more about our work through Self-guided and Docent-Led tours and Audio Tours! Pinto Bean, a female California sea lion. Cashew is a female sea lion found at San Simeon State Beach in San Luis Obispo County emaciated and dehydrated. This pup weighed just 11 kg upon admission on April 30th. 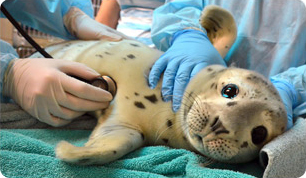 Krabby Patty is a male sea lion pup found at Moss Landing Harbor in Monterey County on May 16th weighing 16kg. He was lethargic, allowed people to approach, had difficulty breathing and had a slightly distended abdomen. Pinto Bean is a female yearling sea lion weighing 20.5 kg found on Moonstone Beach in Cambria in San Luis Obispo County on May 15th. She was moderately underweight but had a fishing line cutting deep into the back of the neck. Bernarda is a female sea lion found at Spooners Cove in San Luis Obispo on April 10th. She was unresponsive to people and suffering from malnutrition. This weaner elephant seal weighed 33.5 kg upon admission. Florida stranded at Hooper Beach in Capitola on April 23rd and was very lethargic due to malnutrition. This male weaner elephant seal weighed 36.5 kg upon admission. Lalaland is a weaner elephant seal that stranded at Cayucos Beach in San Luis Obispo County on April 22nd due to malnutrition and dehydration. This male weighed 39.5 kg upon admission. Parker is a male weaner elephant seal that stranded on Muir Beach in Marin County on May 6th with gummy eyes and malnutrition. He weighed 44.5 kg upon admission. Lutris is a male yearling sea lion that stranded in Pacifica in San Mateo County on May 16th showing abnormal behavior, and he was lethargic and emaciated. This animal is a re-strand and weighed just 13 kg upon admission. SOS Ellie is a weaner elephant seal that stranded at New Brighton State Beach in Santa Cruz. He was chasing people, didn't return to the water, and was malnourished. He weighed 39.5 kg upon admission April 24th.